I just watched the last 4 minutes of the 49ers-Saints Divisional playoff game from this last weekend on NFL Network’s NFL Replay. To say that this was one of the most exciting games I’ve ever been witness to seems like an understatement. This game had it all: a hard hitting affair with offensive fireworks and a raucous home stadium providing the ultimate backdrop for the unfolding drama on the field. The redemption of Alex Smith was apparent as he was not to be denied in those last 4 minutes. Steve Young would say that Alex Smith finally grabbed that “over [his] dead body” quality. According to Young, this is when a great quarterback takes a stand and says, “it’s going down a certain way and you’re going to have to kill me if it doesn’t go down my way.” That’s what I saw at the end of the game on Saturday, and throughout, as well. Even though there were moments when many 49er fans could have thought, “here we go again,” Smith maintained his composure and kept making the plays when he needed to. In his last drive, starting with 1:32 on the clock and only one timeout left, just after Drew Brees and Jimmy Graham had delivered a dagger of a score – an impressive 66 yard pass and run to re-take the lead, 32-29 – Smith lead the 49ers on a 7 play 85 yard drive, capped off by a game winning strike to Vernon Davis, leaving only 9 seconds on the clock. Smith calmly got his team lined up at the line of scrimmage and commanded the offense without panic. He was calculated and patient in the way that he dropped the ball off to Gore as the Saints dropped into deep coverage, inviting Saints defensive coordinator Gregg Williams to bring pressure, as he had done so routinely all game long. Then, Smith saw his opening and did not flinch when he found Davis running away from single coverage, setting the scene for the dramatic victory. The way this game ended for 49er fans brought to life an Oliver Stone-like image of the rise of ghost’s of 49ers past: Joe Montana, Dwight Clark and “The Catch”; Steve Young, Terrell Owens and “The Catch II”; a maligned 49ers quarterback getting the “monkey off [his] back,” a la Steve Young after the 1994 season’s Super Bowl; the 1981 49ers coming out of nowhere – with a 13-3 record, a genius-in-the-making head coach, and an NFL 2nd ranked defense to boot … all swelling up into one moment of history invoking action, attacking our sensibilities as to where the 49ers have been and what they are to become once again – a 10 year siege of ineptitude, failure and frustration wiped away with awe inspiring execution – bringing back shades of a dominant era and one of football’s original dynasties. In typical Harbaugh fashion, the head coach was quick to praise multiple players when prompted about the game winning effort – reemphasizing this year’s 49er doctrine that it is always about the team, the team, the team. “These guys are my heroes. All of them. Alex was heroic in this game. So was Justin, so was Donte, so was Aldon, so was Vernon Davis. You take your play to the heroic. That’s what he did. That’s what all our guys did. Just the way they all fight. It’s a wicked, competitive fight that’s in our guys,” said the steely coach as he reflected on what was, what has been and what will be as the 49ers push on in their run to grab the organizations sixth Lombardi Trophy. Before last night’s 49ers/Steelers game I explained that I thought the 49ers would feature the shallow crossing concept to create winning match-ups in efforts to get the ball to their play-makers: Vernon Davis, Michael Crabtree and Kyle Williams. 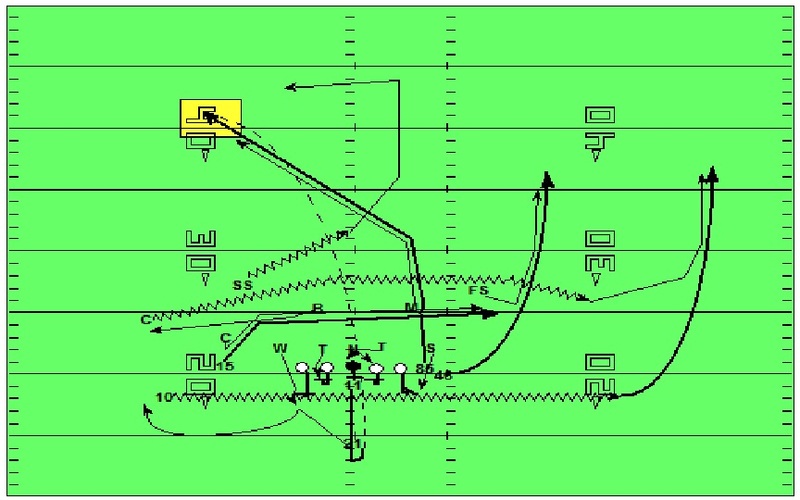 As I stated before, the play concept is great because of its versatility against man and zone coverages (the previous post breaks down the play in a zone blitz situation against the Cardinals). Well, midway through the third quarter, leading only 6-3, the 49ers need a big play to spark some momentum. With a first and ten from their own 21 yard line they dialed up the shallow cross concept and gained 31 yards on a nicely thrown ball from Alex Smith to Davis. 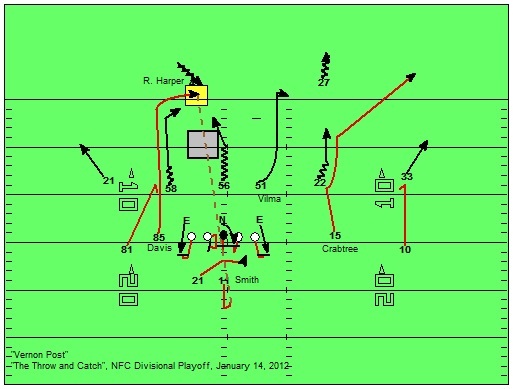 This time, however, Smith passed up his initial target on the shallow crossing route, Crabtree, and hit the big gainer to Davis on the deeper crossing route. Two things to note here, based on my previous analysis of the 49ers’ use of the concept: First, the play against the Cardinals was run against a zone blitzing defensive scheme; this play is run against a man blitzing defensive scheme. 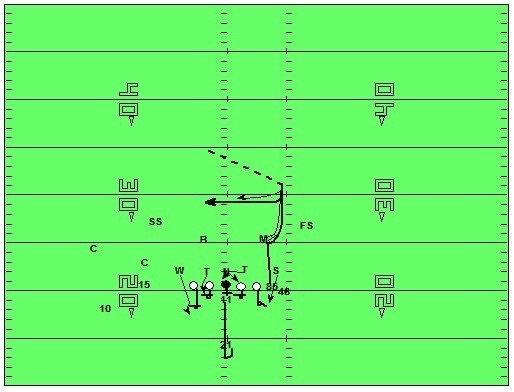 Second, I had stated that against man to man coverage that the deeper crossing WR’s assignment would be to break off his route short and look to pick or rub the shallow crosser’s defender from the other side. As you can see from the diagram and film clip, this was not the case. 1) Davis recognized the man coverage and adjusted by breaking his route deeper, toward the far sideline. He did this because he was able to exploit a mismatch and beat the linebacker over the top. The defender played the route tentative because of the explosive ability that Davis possesses. He should have attempted to jam Davis upon his release and force him outside or funnel him inside, depending on the safety help he was expecting to get over the top. 2) However, Davis’ ability to attack the defender’s leverage with speed (run directly at him) and freeze him – preventing him from making any lateral movement in an effort to jam – is just one of the reasons he is such a threat, anywhere on the field. This advantage in ability allowed Davis to get on top of the linebacker in coverage and effectively create the big play opportunity for the 49ers offense. David Woodley, the linebacker in coverage, also made a mistake when he immediately opened his hips, letting Davis run uncontested, right by him and over the top. 3) I would say that Davis took his “best available release” and that Woodley’s inability to get any sort of contact – to get him out of his route stem – allowed Davis to take the over the top opportunity. If Woodley would have done a better job of re-routing and staying on Davis’ hip, then Davis’ only move would have been to sink his hips, throw the defender by, and break flat underneath. 4) Once Smith recognized that it was man to man coverage (reading the strong side/inside linebacker turn and run with Davis) he initially wanted to throw to Crabtree on the shallow crossing route. Since Crabtree did a poor job in getting any kind of separation from his defender, Smith looked to his second option, Davis, on the “basic cross” (west coast offense term for the deeper crossing route). 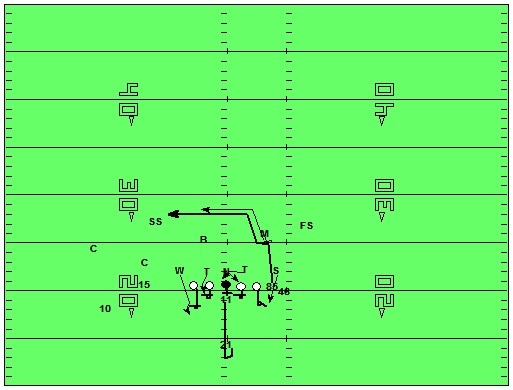 5) Smith takes a 5-step drop, pumps once and recoils, as he reads Davis’ adjustment to take the route deep. Unable to step up in the pocket, due to push up the middle by the Steelers’ “Nose/Tackle” (N’T) stunt, he stands tall and lofts a beautiful touch pass to Davis, over the top of the linebacker and in front of the safety. Smith and Davis took advantage of the Steelers’ mistake – they attempted to cover Davis with an inside linebacker 1 on 1 – and made a momentum shifting play on their way to scoring the first of two touchdowns by the offense on the night. Because of Davis’ relevance in the 49ers passing game again, I would expect to see the Seahawks attempt to “bracket” him with double coverage this weekend, and force Smith and the 49ers passing game to look to other options. In turn, this should also have an ancillary effect – by committing safeties to defend against Davis – and open up the numbers in the box for increased production in the running game. Look for the 49ers to return to a “ground and pound” game plan this weekend against the Seattle Seahawks.